elementary school there and in Japan. She finished high school in Los Angeles, attended Pomona College, and received her Ph.D. in education and psychology from the University of Michigan. She is now professor of early childhood education at the University of Alabama at Birmingham. 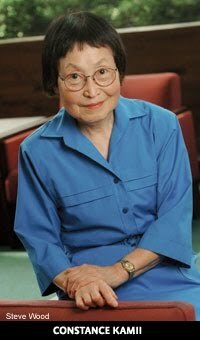 A major concern of hers since her work on the Perry Preschool Project in the 1960s has been the conceptualization of goals and objectives for early childhood education on the basis of a scientific theory explaining children’s sociomoral and intellectual development. Convinced that the only theory in existence that explains this development from the first day of life to adolescence was that of Jean Piaget, she studied under him on and off for 15 years. 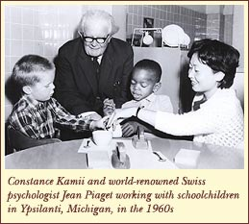 When she was not studying under Piaget in Geneva, she worked closely with teachers in the United States to develop practical ways of using his theory in classrooms. The outcome of this classroom research can be seen in Physical Knowledge in Preschool Education and Group Games in Early Education, which she wrote with Rheta DeVries. Since 1980, she has been extending this curriculum research to the primary grades and wrote Young Children Reinvent Arithmetic (about first grade), Young Children Continue to Reinvent Arithmetic, 2nd Grade, and Young Children Continue to Reinvent Arithmetic, 3rd Grade. In all these books, she emphasized the long-range, over-all aim of education envisioned by Piaget, which is children’s development of sociomoral and intellectual autonomy.